Happy New Year Guys! I know that I have been missing for a while, it's the 9th and I have only posted once, which is totally out of character for me and I guess I have some explaining to do. The thing is I just didn't feel like blogging, or vlogging for that matter either. For sometime I have been in a constant battle with myself, I find that I sit down on the sofa to blog, and get distracted by the television, a hour later and I still haven't written a word. It's now 1.30am and I suddenly have a burst of inspiration, which I have been waiting for! I have a lot to update you on, but I'm not going to do that all at once of course. First I'm going to tell you about my new little project. As many of you know (especially if you watch my vlogs, if you don't why are you not subscribed?) I live in a flat. There isn't a lot of space, and since Christmas our lounge looks like a toy shop. I'm fine with this obviously, as long as Emily is happy then I can cope with the mess. The problem is I don't actually have a space for me. I'm struggling more and more to get my thoughts and feelings out, not just in regards to blogging, but also my journal. It is so vital that I keep up with my journal, I kind of depend on it to keep my mental health stable. I have been speaking to Sam a lot about it, and we've come up with the idea of me having my own little desk space in our bedroom. That way when Emily naps (which is very rare!) or when Sam is home, I can retreat there and work on my blog, edit or journal. Self care is so important, and something I want to keep up with. I have been looking back on posts and come to realize just how far I have come, and I really don't want to go backwards. Moving on from that, I thought I would share with you what I plan on doing. I want to keep with our colour scheme in our bedroom which is white, pale blue and grey. I have found a gorgeous white desk from Ikea, which will fit perfectly in the space I have, all of our furniture is white, I find it brightens up our room no end. So I'll talk you through my picks, I have had my eye on this Eames style chair for a while, I was just unsure where I would put it. It does seem like the perfect chair to complement the desk I am going for. The chair is a bargain under £30. The desk is a basic white one from Ikea, I needed a pretty small desk as we are limited on space, but after measuring up, this Micke desk would fit perfectly. I then picked a plain white lamp from Ikea to go ontop, this way if I get the urge to blog at silly o'clock in the morning, I wont wake Sam up by having the light on. I also wanted to find a throw to go over the chair, unfortunately I get cold very easily, and this throw would be perfect for those chilly nights. The next few things are just to go ontop of the desk, this rose metal pen pot would be the perfect thing to add a little splash of colour, It would store all of my pens so they are in reach whenever a perfect idea comes to mind. 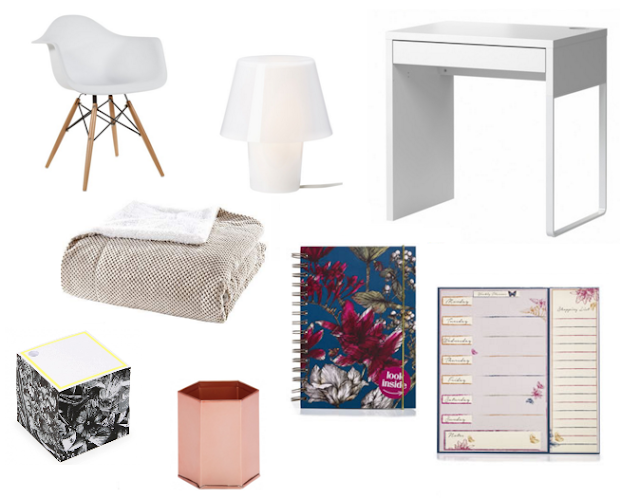 I also love the mono floral memo pad, it will be so handy having this on my desk as I am always loosing bits of paper. I also love this A5 notebook, and deskpad. The deskpad has a shopping list one side and a meal plan the other, this will be the perfect thing to help me get organised for the week ahead. I can't wait to make my little space my own, and actually have a creative space to work with.